Patient was referred to Illinois Retina Associates for 3 years of poor vision in his right eye. He was a healthy 14-year old boy with no prior medical history. He had no history of trauma or eye surgery. Vision was hand motion in the right eye and 20/20 in the left without correction. Pressures were normal. There was a right afferent pupillary defect. The right anterior chamber was shallow. Fundus photos of the right and left eyes are shown below. The right eye showed an open funnel retinal detachment with underlying retinal hemangiomas. The left eye showed multiple retinal hemangiomas. 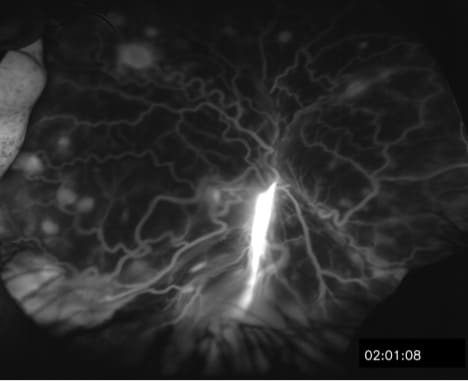 Fluorescein angiography (FA) confirmed the presence of multiple retinal hemangiomas. Based on the findings of multiple retinal hemangiomas, a work up for Von Hippel Lindau syndrome was undertaken. A diagnosis was confirmed with genetic testing. Other manifestations of the disease in this patient were diagnosed including a hemangioblastoma in the cerebellum, cervical hemangioblastomas, and a pancreatic cyst. Von Hippel Lindau (VHL) syndrome is a genetic disease of a specific tumor suppressor genes. It is typically inherited in an autosomal dominant fashion with high penetrance. About 1 in 35,000 people are affected. Because of this ineffective gene, the patients may develop a variety of benign and malignant tumors. The most common presenting feature for VHL is retinal capillary hemangioma. Although benign tumors, they may cause problems by causing swelling of the retina or retinal detachment. If causing problems, the tumors may be treated with surgical resection, cryotherapy, photodynamic therapy, photocoagulation, anti-VEGF therapy or radiation. Avci R, Yilmaz S, Inan UU, Kaderli B, Cevik SG. 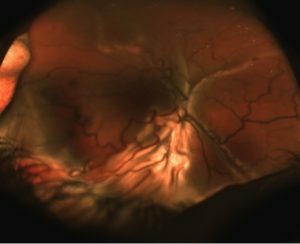 Vitreoretinal Surgery for Patients with Severe Exudative and Proliferative Manifestations of Retinal Capillary Hemangioblastoma because of Von Hippel-Lindau Disease. Retina 2017; 37:782-788. Papastefanou VP, Pilli S, Stinghe A, Lotery AJ, Cohen VM. Photodynamic therapy for retinal capillary hemangioma. Eye (Lond) 2013; 27:438-442. 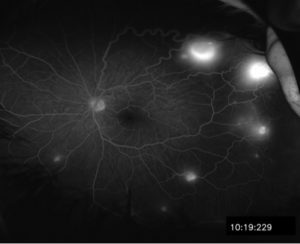 Slim E, Antoun J, Kourie HR, Schakkal A, Cherfan G. Intravitreal bevacizumab for retinal capillary hemangioblastoma: A case series and literature review. Can J Ophthalmol 2014; 49:450-457.